Traditional peasant costumes of Geiltal, Austria. Home » Traditional peasant costumes of Geiltal, Austria. A PEASANT OF THE GEILTAL. THE dress of the men of Geiltal, in former times of an extremely peculiar fashion, is even at the present day unique and original. They keep the hair cut short. The high crowned sugar-loaf hat, of a green or black color, is daily becoming more rare among them; the hat is now more commonly worn with a low crown; it is made of felt in winter, and in summer of straw. The neck is encircled with a plaited frill, sewed to the shirt. 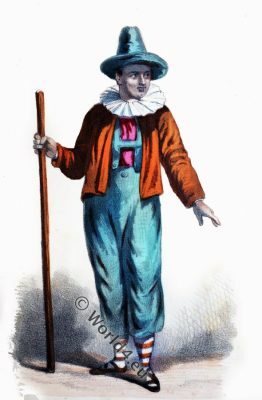 The waistcoat is red, and is fastened to the trousers by green braces; the doublet is brown; the trousers are brown or green, and reach no lower than the middle of the calf; the stockings are of white worsted; the sandals or slippers are made of bark. A PEASANT WOMAN OF THE GEILTHAL. It is from the Illyrian peasantry, and in particular those of the Geiltal, that the Italian theatre has borrowed the dress of some of its buffoons. That of the men, as described above, bears some resemblance to the costume of various burlesque characters in the ancient shows. A PEASANT WOMAN OF THE GEILTAL. THE women of the Geiltal let their hair hang in long twists, which the unmarried females intertwine with ribbons of silk or red worsted. The head-dress of the married women consists of a kind of round cap, which is sometimes fastened above with a black ribbon. They wear also a necklace of glass beads, made to imitate coral, and a broad muslin ruff or frill, with very small plaits. Their short-sleeved jacket is usually red; the petticoat and apron blue, with borders of a strongly contrasted color; wide ruffles hang down at the elbow; and in winter a brown cloak covers the whole. Their petticoats seldom reach much lower than the knee. This dress is extremely light, and well suited to the mode of life of these mountaineers. Their stockings are of white or colored worsted; their sandals are tied with ribbons or thongs. The waist is encircled with a girdle of black fur, adorned with small plates of copper; upon it hangs a closed knife. They seldom wear their hats, unless obliged to do so by rain or the heat of the sun; in general they carry them hanging by a ribbon to the arm. The Gailtal (Slovenian Ziljska dolina) is a valley running from East Tyrol to Carinthia. It begins in Tilliach and ends at Villach, where the Gail flows into the Drau near Maria Gail. The Gailtal is particularly attractive because of the contrast between the flat, wide valley floor and the partly steep mountain slopes. It is lined in the north by the Lienz Dolomites and the Gailtaler Alps, in the south by Karnische Alps and Karawanken. In Carinthia, it is spread over the districts Hermagor (Šmohor) and Villach-Land, in East Tyrol is located in the district of Lienz. While the upper Gailtal is German-speaking, a Slovenian population with its own dialect has been preserved to the east of Hermagor, in the Lower Gail Valley. The Gailtal was essentially Germanized from East Tyrol and the Drautal. Accordingly, the Tyrolean dialect extends to Carinthia through the whole Lesach valley. The Gailtalian, which is spoken in the lower reaches of the Gail, has a distinct upper chamber. This entry was posted in 1868, 19th Century, Austria, Traditional and tagged Traditional Australian costumes on 4/30/17 by world4.